Thousands of South African supporters of Israel marched through the streets of Pretoria, the capital, on Wednesday, demanding the reinstatement of South Africa’s envoy to Israel, along with an end to the efforts of the ruling African National Congress (ANC) to further downgrade diplomatic ties with the Jewish state. Rallying on Wednesday outside Union Buildings — the seat of the South African government — the predominantly Christian marchers carried placards reading “SA Bless Israel” and “No Cutting Ties With Israel.” South Africa’s ambassador in Tel Aviv, Sisa Ngombane, was recalled to Pretoria on May 14 as a gesture of solidarity with the violent Palestinian demonstrations on the Israel-Gaza border. Political party leaders at the rally included Mosiuoa Lekota of the Congress of the People (COPE) and Rev. Kenneth Meshoe of the African Democratic Christian Party (ADCP), South African news outlet IOL reported. A petition with 41,000 signatures urging the restoration of ties with Israel was presented to the South African presidency’s office. Rev. Meshoe told the crowd that the ANC’s forthcoming bid in 2019 for the votes of South Africa’s professed Christians — more than 80 percent of the country’s population of 56 million — might be rebuffed if its political and diplomatic campaign against Israel continues. At its special conference in December 2017 where members of Hamas were honored, the ANC voted to downgrade South Africa’s embassy in Israel to a “Liaison Office.” Over the last six months, the ruling party has stepped up its anti-Israel rhetoric amid the unrest on the Gaza border, further raising the profile of the country’s vocal boycott, divestment and sanctions (BDS) movement. 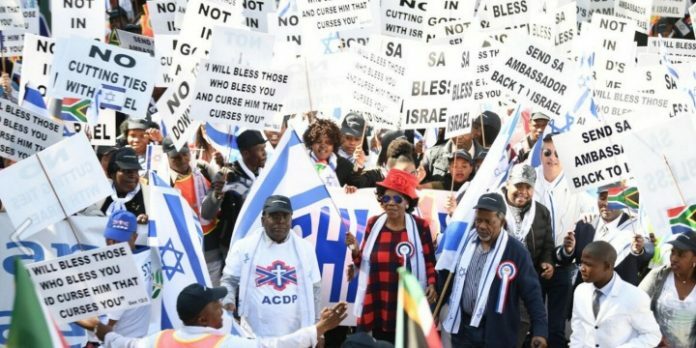 “The people that are here, the majority of them are Christians who are saying to the ANC, ‘If you don’t listen to these thousands who are here to represent millions of Christians in South Africa, who are saying do not downgrade the Israeli embassy, then next year Hamas, which influences you, won’t be there to vote for you,’” Rev. Meshoe declared. “Every year, you get thousands of Christians who go on a pilgrimage to Israel and we don’t want that to be undermined by people who are expecting votes from the Christians,” Meshoe said. In his address, COPE leader Mosiuoa Lekota emphasized that the sympathy among South Africans for the plight of the Palestinians was being exploited by activists opposed to Israel. “We cannot support or accept that some of the young people and some of the people who support Palestine now use our country as a platform to attack Israel,” Lekota said. Wednesday’s rally was greeted warmly by South Africa’s embattled pro-Israel organizations. Many of South Africa’s Christians belong to the Pentecostal churches that have grown at a rate of 800,000 members every year his century, according to local researchers. Worship in these churches typically stresses a reverence for the Jewish Bible alongside the Christian Gospels. Next articleCan One Cry on Shabbos?